The Zheng Han Ancient City is located at the joint of the Shuangji River and the Yellow River near the city gate of Xinzheng City in Henan Province. The Zheng Han Ancient City is the site of the capital city of the Zheng State and the Han State. During the late Western Zhou period (11thcentury - 771BC), the Zheng State established its capital here. After the Han state overthrew the Zheng State in 375BC, it moved its capital there. The capital city was abandoned when the Qin State conquered the Han State in 230BC. 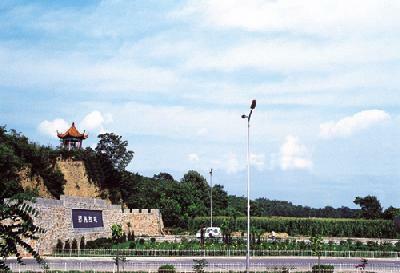 Once acting as the capital of Zheng and Han states for over 500 years, the site was named as Zheng Han Ancient City. Excavation conducted by Henan provincial museum in 1964 gave a rough picture of the city site. The city is of no regular shape. The well-preserved city wall is 19 kilometers in perimeter, the average height of which is about 10 meters above the ground with the highest point at 18 meters. A wall inside divided the ancient city into eastern and western parts. The western part is a palace, 2,400 meters wide from east to west and 4,300 meters long from north to south. A large foundation was discovered in the city together with a cellar that had 5 wells inside. Some scholars believe the basement is for food storage. The eastern part is the outer city, with the north wall of 1800 meters long, the east wall of 5,100 meters and the south wall of 2,900 meters. The west wall acted as a partition, and the only city gate was found in the east wall. Various workshops were distributed inside the city, with copper-smelting workshops occupying an area of over 100,000 square meters, bone-making workshops of 7,000 square meters, and iron-casting of 40,000 square meters. More over, a number of iron wares and pottery models were unearthed inside the city, together with over 180 copper weapons, most of which were made under the governmental supervision. In the south part of the palace and the southwest of the outer city was the buried ground of nobles living in the Spring and Autumn Period (770-476BC). In the autumn of 1923, about 100 objects were excavated in one of the tombs, including bell, tripod caldron, wine vessel, kettle, washing utensil, food vessel, plate, stove, and bronze equipments such as weapon, vehicle equipment and decoration on horse. Among these copper vessels were a set of nine Dalao Tripod Caldron, a set of seven Tripod Caldron, together with 8 copper food vessels, in accordance with the rite system stated in the Book of Rites. Judged from these objects, the owner of this tomb should be a high-ranking noble in the Zheng State. Differing from other vessels in the same tomb, the inscription, shape and patterns of the unearthed Wangziying Stove have distinct features as that of Chu vessels. According to recent researches, the stove was believed to be made under the order of Zichong, a high military official of the Chu State, and abandoned by Chu troops after they were defeated by Zheng troops in the Duling Battle fought in the 16thyear (575BC) of the Chenggong reign of Lu State. The most famous one among the unearthed copper vessels is a Lotus-Crane Square Pot, with its bottom carved into the shape of two rushing beasts, layer upon layer of lotus petals carved on the lid, and a crane with spreading wings standing in the petals. The artistic sculpture broke the dignified and peculiar tradition adopted since Shang and Zhou dynasties and became the representative work of new style bronze vessels created in Spring and Autumn Period. Most excavated vessels are now collected and exhibited in Henan provincial museum.